Are you looking for a Melbourne based event wedding planner for your upcoming event? Celestial Weddings &Events are having the Grand Opening of their new premises in Port Melbourne on Friday July 1st 2016. It will be a night not to be missed. Come along and meet the planners, enjoy the music and be immersed in the beautiful atmosphere. If you have ANYTHING left to organise for your special day - make sure you are there! "At Celestial Weddings we understand that each and every couple has their own story to tell. We appreciate the uniqueness of each couple’s inspirational story. And behind EVERY unforgettable experience is a LOT of passion! We pride ourselves alongside the most valued suppliers in the event business to work on your Grand event. 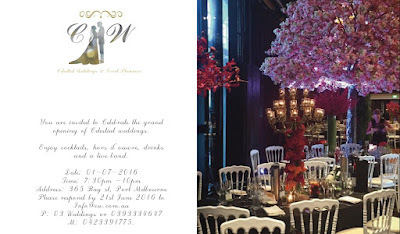 Celestial weddings is a full wedding & Event planning business dedicated to our clients". Enjoy cocktails, hors d'oeuvres and and live music. See some of Melbourne's best wedding industry specialists and meet the event planning team. Thanks for sharing this information on celestial weddings and events. Recently, arranged my company’s outdoor meet at one of exotic Los Angeles event venues. Had a grand dinner party and all appreciated my arrangements.